All children must have an opportunity to share the joy of choral music participation - whether in school, church, or community choirs. What happens before the singing begins, is critical to supporting, sustaining, and nurturing choirs to give every child the opportunity to experience the wonder of choral singing. Based on years of experience conducting and teaching, Barbara Tagg brings a wealth of practical information about ways of organizing choirs. 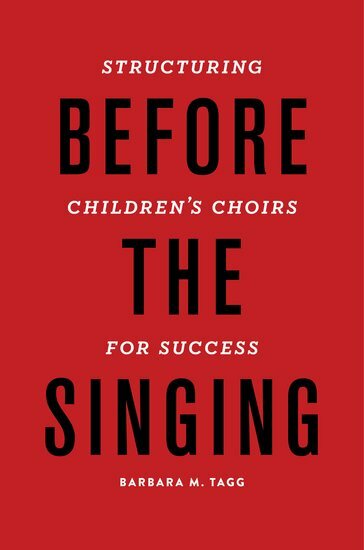 From classroom choirs, to mission statements, boards of directors, commissioning, auditioning, and repertoire, Before the Singing will inspire new ways of thinking about how choirs organize their daily tasks. The collaborative community that surrounds a choir includes conductors, music educators, church choir directors, board members, volunteers, staff, administrators, and university students in music education and nonprofit arts management degree programs. For all these, Tagg offers a wealth of knowledge about creating a positive environment to support artistry, creativity, dedication, and a commitment to striving for excellence.